Kmart is having another Double Coupon event from now until 6/25. This time they are not limiting the total amount of double coupons you can use however there is a limit of 4 like coupons. Coupons up to $0.99 will be doubled. 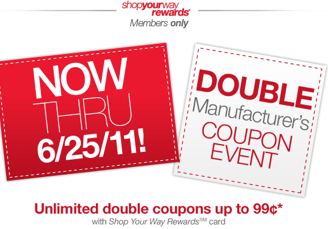 You will need to use your Kmart Shop You Way card to participate in the double coupon event. So be sure to sign up for one if you haven’t already. Double Manufacturer Coupons Up to .99¢! A valid Shop Your Way Rewards (SM) member number must be entered at time of purchase to participate in the double coupon event. Participating stores only. Kmart will double manufacturer coupons with a face value of .99¢ or less. Amount of credit from doubling a coupon cannot exceed the current retail price of a single item. You may only purchase 4 of the same item using double coupons. Excludes Buy One, Get One offers, Kmart Savings coupons and Kmart Store coupons.